Looking for the perfect gift but not sure what to buy? 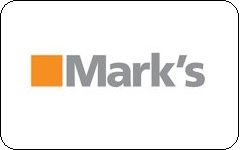 Take the guesswork out of gift giving with a Mark’s Gift Card. Give this Stripe Gift Card for any occasion. All gift cards come in $25, $50 and $100 amounts. All Mark’s gift cards can be used in one of our many stores across Canada or online from the comfort of your own home. We can also ship your gift card anywhere you need it to go. Send it to someone else as a gift or we can ship it right to you if you want to put it on a card and give it in person. You can also check the balance of your gift card right on Marks.com. Just one more step to make gift giving easy at Mark’s. All Gift Cards also come with a FREE matching greeting card.